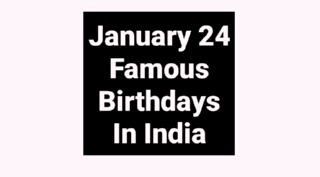 In this post -- Famous Birthdays January 24 Bollywood Actor Actress Cricket Politics, check who are sharing your birthday in India 24 January's famous birthday personality in India like Bollywood actor, actress, cricketer, politician and all famous Indian celebrity. January 24 famous birthdays in India. Riya Sen born Riya Dev Varma on 24 January 1981) is an Indian film actress and model. Riya, who comes from a family of actors including her grandmother Suchitra Sen, mother Moon Moon Sen and sister Raima Sen, began her acting career in 1991 as a child actress in the film Vishkanya. Her first commercial success in her film career was with Style. Rahul Bhatt (born January 24, 1982), is an Indian fitness trainer and an aspiring film actor. The son of famous film director Mahesh Bhatt and Kiran Bhatt, Rahul gained unwitting notoriety in 2009 following revelations that David Headley, an accused in the 2008 Mumbai attacks, had befriended him.In an investigative report by PBS, Rahul Bhatt was described as a B-movie actor. Arnab Goswami is an Indian journalist who is the Editor in Chief and News anchor of the Indian news channel Times Now. He is an important contributor to the rise of the Times Now news channel since its launch in January 2006. His show The Newshour is aired at 9 pm (IST)on weekdays with live news coverage. Arnab Goswami also hosts a special television program. Shah Nawaz Khan (24 January 1914 – 9 December 1983) was an Indian soldier who is remembered as an officer who served in the Second Indian National Army during World War II and later came to be one of the three defendants in the first of the INA trials in 1946. He was born in village Matore, Kahuta, Rawalpindi District, British India, (now in Pakistan). J. Om Prakash (b. 24 January 1927, India) is a famous Indian film producer. His daughter is married to Rakesh Roshan, making him Hrithik Roshan's maternal grandfather. Ajay Rao is one of the most talented Kannada cine actor. He debuted with the 2003 film Excuse Me. Ajay did his debut and began his career as a hero in director Prem's movie Excuse Me. The other cast along side were Ramya and Sunil Rao. He played the role of a musician who is in love with the girl, but typically is unable to tell her. The film was a big success and Ajay's work was appreciated. Mallipudi Raju Pallam Mangapati (born 31 August 1962) is a member of the 9th, 14th and 15th Lok Sabha of India. He represents the Kakinada constituency of Andhra Pradesh and is a member of the Indian National Congress. He is Minister of State in the Ministry of Defence Pallam Raju was born in Pithapuram, East Godavari district of Andhra Pradesh, India. Santha Rama Rau (24 January 1923 – 21 April 2009) was an Indian American travel writer. Her father, Sir Benegal Rama Rau, was an Indian diplomat and ambassador. Her mother was Dhanvanthi Rama Rau, a leader in the Indian women's rights movement who was the International President of Planned Parenthood. As a young girl, Rama Rau lived in an India under British rule. When she was six. Karpoori Thakur (24 January 1924-18 February 1988) was an Indian politician from the Bihar state. He was popularly known as Jan Nayak (Hindi for "the people's leader"). He served as the Chief Minister of Bihar from December 1970 to June 1971 (Socialist Party/Bharatiya Kranti Dal), and from December 1977 to April 1979 (Janata Party). Karpoori Thakur, son of Gokul Thakur, was born in Pitaunjhia. Rooma Mehra (born 24 January 1967) is an Indian poet, painter and sculptor, a free lance writer of human interest articles for several newspapers and a columnist for the Indian Express. Mehra is a self-taught artist with a social conscience, who has had 11 solo shows of her paintings, reliefs and sculptures. Her artworks are found in private and permanent collections including the National Gallery. Pulin Behari Das (24 January 1877 - 17 August 1949) was an Indian revolutionary and the founder-president of the Dhaka Anushilan Samiti. Pulin came from a middle class Bengali Hindu family. Though they held landed property they were mostly service holders. His father was an advocate at the sub-divisional court in Madaripur. See Tagore for disambiguation Gnanendramohan Tagore (also Gyanendramohan Tagore)(January 24, 1826 – January 5, 1890) was the first Asian to be called to the bar in England, in 1862. Gnanendramohan Tagore was the son of Prasanna Coomar Tagore and grandson of Gopi Mohan Tagore one of the founders of Hindu College, of the Pathuriaghata branch of the Tagore family. Rajiv Ranjan Singh (born 24 January 1955) is a member of the 15th Lok Sabha of India. He represents the Munger constituency of Bihar and is a member of the Janata Dal (United) (JD(U)) political party. He previously represented the Begusarai constituency in the 14th Lok Sabha of India. He was a also a Rajya Sabha member from Bihar before elected to Loksabha. Kaith Handa (born 24 January 1985) is an Indian model and film actor, originally from New Delhi, India. who has gone from modeling into commercials (Nokia IPL, Norton anti-virus, Reliance service provider, Hero Honda Director Special, Maggi, Himalaya oil balance face wash) to an acting debut Hindi film (khichri). Recently, he did Gladrags Manhunt Contest 2010 .couple of walks for like C.N.Wadia.